Youtube videos are generally short and crisp. However, there are times when you want to share only small part of long Youtube video. There is an easy hack whick allows you to link and share specific part of Youtube. This is based on start time (on the timeline) from the point you want video to play. For example: To start video after 1minutes 50 seconds add #t=1m50 at the end of Youtube video URL. To start video after 50 seconds, then add #t=50s at the end of the URL. If doing this manually is too much hassle then head over to Youtube time. It provides neat interface to generate customized URL for video to start after specific time. 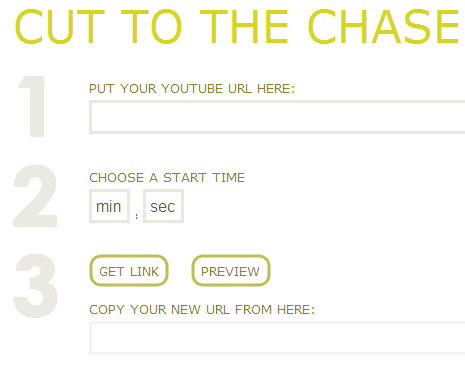 Just enter Youtube video URL, chose the start time (mins & secs) and grab your customized Youtube video UR at YoutubeTime.